This article is 2876 days old. 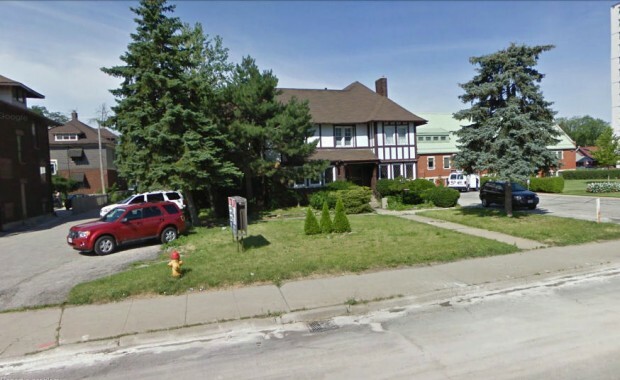 Windsor City Council has approved demolition of the Ernest Wilby House located at 1567 Ouellette Avenue. The Owners of the Ernest Wilby House, located at 1567 Ouellette Avenue have made a request to demolish the historic building. The house was placed on the Windsor Municipal Heritage Register in September 2010. The house was built-in 1930, and is asymmetrical Tudor Revival style, and features dark red brick on the first floor and stucco half-timbering on the second, and a hipped roof that is slightly flared. On the left side wall is a chimney against a gable, flanked by arched casement windows on the first floor. The shed roof of the centred porch continues over a first-storey room. Additions over the years have more than tripled the size of the original L shaped building. The house is currently vacant and has been for over three years. Over the years it was a funeral home, restaurant and most recent a call centre. The mortgagees in possession state that the house has dead animals inside and water leaks, and that it is costing money to keep it secured. They also say that it is a liability and they do not want to invest additional funds into it, and have requested approval to demolish it. They have no plans for new construction on the site. A building report commissioned stated that while the building is sound, the poor condition of some outside elements and the poor condition of most interior finishes would deem the building suitable for demolition. The house first came before city council in March, and a 60 day time limit was placed on demolition which expires today. Council will decide tonight to either allow demolition or to proceed with a designation under the Ontario Heritage Act.